Stack began his career at Arsenal but made just five first team appearances in goal for the club, spending time on loan at Millwall and Belgian club KSK Beveren before joining Reading in 2005. A former Republic of Ireland under-21 international, he could not secure a place in the Reading first team and was loaned to Leeds United and Wolves. 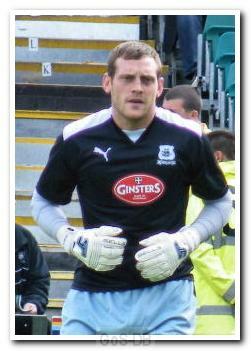 After he was released by Reading, he joined Argyle and started the 2008-09 season as first choice 'keeper. Despite a good start to the campaign he lost his place to Romain Larrieu, and some less than complimentary comments about the club led to a fall-out with manager Paul Sturrock. Stack was loaned to Blackpool and Wolverhampton Wanderers before he was released by Argyle in the summer of 2009, after which he joined Hibernian. In a three year stay at Easter Road, Stack made 56 appearances, mainly as first-choice 'keeper during the 2009-10 season, before leaving the club when his contract expired in May 2012. Three months later he returned to London to sign for League Two Barnet. He was given the captaincy in the absence of Edgar Davids and club vice-captain Barry Fuller, and a series of excellent performances was rewarded with a three-year contract extension, tying him to the club until June 2016. In a troubled 2012-13 campaign, Barnet spent most of the season struggling at the wrong end of League Two. Despite saving a 94th minute penalty to cement a 1-0 win against Wycombe Wanderers in the last-ever league game at Underhill, Barnet were relegated from the Football League the following Saturday when they lost on the last day, 2-0 at Northampton. At the start of the 2013-14 season Stack started life in the Conference National – an irony perhaps not lost on some Argyle fans given the comments made about the club whilst at Home Park. In October 2013 he lined up alongside former Argyle manager Carl Fletcher, who had chosen the Bees to resume his playing career. Stack played regularly for Barnet over the following two seasons, including their 2014-15 promotion-winning campaign in which he missed just one game. Back in the Football League at 33 years old, Stack continued to be Barnet's first-choice 'keeper.